Continuing the discussion around the Leadership Statement, we will be featuring some of our most talented leaders and asking them to reflect on the attributes they feel define great leadership. I joined the Civil Service as an AA when I was 16 years old. In Northern Ireland in the 1970s - I joined in 1978 - it was my aspiration to be a civil servant. It made your family proud as you had a job for life. It was also a job you needed an education for, if at least secondary school level. When I was a child, my father used to bring home unwanted or disused stationery and I would play with it and I have always loved stationery and organising papers ever since! When the Northern Ireland Civil Service advertised at school at 16, I decided to apply. I got the job and left school on Friday, starting work on Monday. I loved every bit of it. Personally, I would like the skill to speak languages. My perspective is that it is about being able to converse with people in their own language. You have more of a scope to connect to people with their language. Professionally, I would say IT skills. I am not currently good with IT, but it is part of the digital future. This is a skills gap for myself and I intend to do something about it. What is the biggest lesson you have learned in your career to date? I think it is to know your people and to let them know you. You can’t get to know people if you are guarded, you need to be open and relate to people. When asking people to do challenging and stretching things, personal relationships with them allow trust. People are more inclined if they get to know you. I feel my team would do anything I asked of them, but still ask questions of the best ways of doing things. They are constructive people and want to do things, taking judgement on board and telling me when I get things wrong which is always good! Which point of the Leadership Statement do you think is the most challenging and why? I think the challenge is not so much in the Statement itself but in living the values and behaviours to the extent that others recognise them in you. People have got to read the statement and think about their leader. That is the challenge of the entire statement. How have you improved your leadership skills in the past year? I learn from people at a higher level, by listening to more senior people than myself, how they phrase sentences and contextualise situations. My boss is an SCS1 and I can see the value in what he does and me learning from it. What’s the question you’d most like to have been asked (and why)? It is so important for us to have pride in ourselves, our people and our organisation. Not enough people are proud of what they do. I feel privileged to work for government. I talked about it in my Leader of the Year Award acceptance speech, how we should feel proud to serve ministers and the public. I am proud to do that. 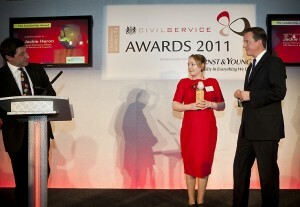 Jackie was the winner of the HMRC People Award and CS Award for Leadership in 2011. In 2007 Jackie took over a team of 300 staff who processed Tax Credits. The site at which she worked was synonymous with poor performance, attendance, engagement and resistance to change. Under her tenure the unit was transformed and was subsequently allocated high priority Value for Money and Error & Fraud tasks. They delivered great results: £1.9m in arrears paid, £83.5m of debt reduced and £22.5m yield delivered. Jackie was recognised for her ability at managing change, driving continual improvement and uniting people regardless of the challenge. She gave everybody scope to develop their talent. Jackie believes in people, sees talent in everyone and is always prepared to shake up the established order.